If you haven’t explored short video for your business, you may be missing out on an opportunity for more reach and shares. In this article you’ll discover six ways you can use short video to grab attention. With the examples below, you’ll find plenty of inspiration. 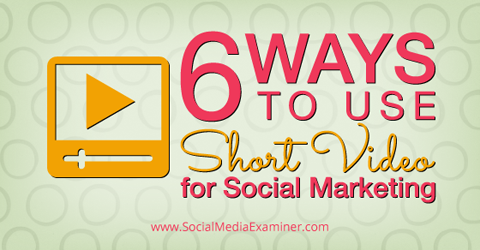 Discover 6 ways to use short video for marketing. While you might naturally think of YouTube when you think of video, it’s not the only platform embracing video content. From the moment the first movie trailer was released on Instagram, it was only a matter of time until marketers and businesses began to embrace the power of short video—and the ease of sharing it in places other than YouTube. There has been a rush of creative video produced by brands ever since. It only takes one person to start a revolution! Check out this 15sec #JobsInstagramTrailer & SHARE it to inspire your friends! See #JobsMovie in theaters, 8/16. In fact, short-form video content is streamed to us in a range of formats on a variety of social platforms—6-second Vine videos, 15-second Instavids on Instagram, 2- to 3-minute videos on Facebook and news feed videos on Google+. LinkedIn also features video via Professional Portfolio and videos can be “pinned” to Pinterest. But why is short video so popular? The shift is likely due to a number of factors. The attraction of short-form social videos lies in their “snackable” nature. Short videos suit our busy lives, brief attention spans and the need to consume content easily and quickly. Because fans are consuming content via their mobile devices while they’re on the go, the shorter the content is, the better. Showing your fans how to do something (e.g., solve a problem or challenge or use your product) is perhaps one of the easiest ways to jump into creating short video content. For example, Video Meals has attracted thousands of loyal fans on Instagram by using video snapshots overlaid with spoken step-by-step instructions for creating a healthy meal. These quick videos drive traffic to the Video Meals website and ebook with a link in the description. And take a look at these videos on fitness site MelissaMade. Melissa creates split-screen video posts that show an exercise on one side, and her describing it on the other. If this looks like technical wizardry to you, then you’re in for a surprise. Anyone can create amazing split-screen videos with a simple tool called Pic Play Post. One challenge of creating short useful video is distilling your message into its simplest form. Lowe’s has a whole series of helpful how-to videos on their Vine account. It’s amazing what you can show in just 6 seconds! With the tools available for creating short video content, it’s easier than ever to create a how-to or DIY video. The shorter the video and the simpler the steps, the more likely fans will love it, use it and share it. Zach King is a huge success on both Vine and Instagram. Known as the Final Cut King, Zach creates addictive special-effect videos that show everyday situations with a twist! Because each video is short and engaging, it’s hard to watch just one. By showcasing his skills and including a call to action with his videos, he’s not just being entertaining—he’s also bringing attention to his business (an online school that trains others in filmmaking techniques, including special effects). For many people, seeing really is believing. Make your mark by showing your audience what you can do and how it benefits them. When a popular event or celebration is coming up on the calendar, it’s likely that others in your industry will be looking for relevant content to share. Clever brands get the jump on a season, event or celebration by posting short video content that’s primed for sharing. Take a look at this clever video that MyKidsTime made using the Stop Motion app. Not only did this video resonate with their fans, it was also shared often by other page admins who were looking for great content to post on Facebook around Christmas. Think about what you can create for the next event coming up in your industry. You don’t have to be overly promotional to showcase your products. You can make it fun by appealing to your audience’s natural curiosity. And active-wear company Lorna Jane featured some of their team to announce their summer shorts sale in a fun way. Make it about the people, not the product! A short video is a fun way to let your fans see the people behind the business—to show what happens behind closed doors. Constant Contact often gives their fans a look at the people behind the company. In the following example, they posted a simple video of their Day of Service. Who doesn’t want to know more about a company whose employees have fun together—and one that contributes to charity? Whether it’s a tour of your office, an event you’re attending or just some behind-the-scenes downtime, showing the fun side of your business can be more effective than just hawking your wares. When you add short, engaging video to the mix, fans really feel that they get a sense of who you are as a company (not just what you sell). Professional videos look great, but you don’t need a huge budget to make an impact. Creative marketers can do amazing things with simple props and everyday objects. Some of the best short videos don’t rely on big-budget design and animation—they’re the ones that use everyday items. What can you create with the objects around you? 1. Want to start creating short videos? Then you’ll want to consider using some of these tools.Just starting out on video? You can’t go wrong with Instagram’s built-in video tool. It allows you to film in sections so you can seamlessly join your edited video together in a professional way. 2. Hyperlapse is a clever tool by Instagram that allows you to create time-lapse videos. It allows you to condense longer videos for a short video effect—a speedy way to tell your story. Hyperlapse is perfect for behind-the-scenes videos and unboxing videos. You could even take your fans on a “quick” tour of your office. 3. Flipagram is super-easy to use and helps bring your images to life to create beautiful short video stories. It’s perfect for posting to Instagram or Facebook. Many people use the videos to give a shout-out to fans, review an event and more. It’s available in the Apple Store, and it’s available for Android and Windows as well. 4. The Videohance app truly makes your videos look beautiful. It allows you to edit in real time on your phone by adding effects, borders, light leaks, text, music and more. With Videohance, it’s easy to create something that looks quite professional! It’s available for iPhone. 5. The Stop Motion app is easy to use and so much fun. As an alternative to Google Play, it allows you to create videos with the fun stop-motion technique. You can also check out Stop-Motion Lite. Both are available on iOS. 6. Whereas other video apps focus on the visuals, Adobe Voice focuses on the voice and turns your story into an animated video in minutes. Speak into the device to tell your story in short sentences or sections, then add animation, images, photos, sound and text. It’s available for iPad. 7. Put simply, 8mm will take you back in time. This low-cost app allows you to create old-fashioned 8mm movies in real time. The app is available for the iPhone and iPad. 8. Not strictly a video tool, Cinemagram allows you to animate one part of an image, which is a cool effect, and one worth having in your kit bag. 9. The iMovie app is another in-phone editing tool you can use on the go. It has a lot of the popular features of the desktop iMovie program, allowing you to add audio, text and special effects from your phone. It’s available for iPhone, iPad and iPod Touch. 10. Kinemaster Pro Video Editor is a full-featured video editing tool that enables you to work from your smartphone. It’s available for Android (but not all devices). The next time you check out your favorite brand on a social network, take note of any short video content they produce. What ideas do they spark? With the video creation and editing tools we have at our disposal, it’s so easy for businesses to add short video content to their marketing mix. Which video creation tactic or tool resonated with you? Are you already using short-form video to tell your brand’s story? Please leave your ideas in the comments below.